Last year we were asked to design a new guarding system to replace some original guarding on a packaging line at a pharmaceutical company. The original molded polycarbonate guarding was cracked and broken. Our new design featured a section with triple sliding doors, lifting doors on gas springs and a pair of double sliding doors. 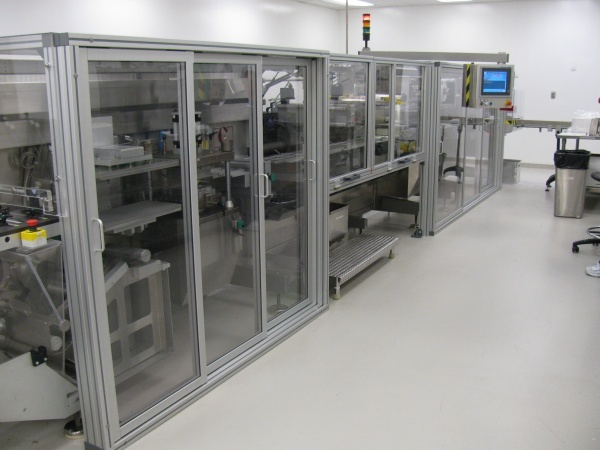 Using MiniTec t-slotted framing, we were able to customize access to this pharmaceutical packaging line to allow better work-flow and create a clean looking finished design. For the customer, the project turnaround was quick, and it saved them money over having new custom-molded polycarbonate guards made.